Final Farm Bill Encourages Mass Timber Innovation. M-Fire Encourages The CLT Industry To Add Additional Fire Protection To Reduce Risk And Create Carbon Storage Banks. 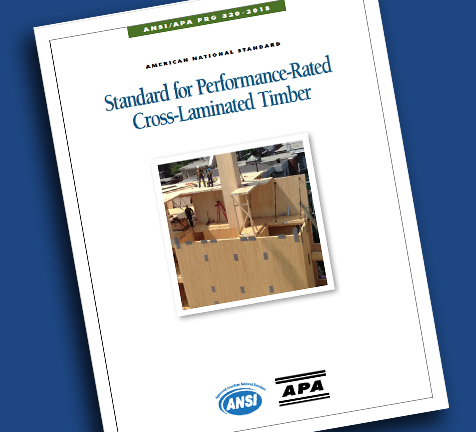 ANSI/APA PRG 320 Standard for Performance-Rated Cross-Laminated Timber Provides requirements and test methods for qualification and quality assurance for performance-rated CLT, which is manufactured from solid-sawn lumber or structural composite lumber. WASHINGTON – American Wood Council (AWC) President & CEO Robert Glowinski issued the following statement regarding today’s final passage of the 2018 Farm Bill. The bill includes the Research Title and Wood Innovation Grant language from the Timber Innovation Act (S.538/H.R. 1380), and separately a clarification on what constitutes a “USDA Certified Biobased Product” under federal procurement guidelines. AWC partnered with the National Alliance of Forest Owners and Southeastern Lumber Manufacturers Association. M-Fire is a big supporter in mass timber and we're asking the President to raise the bar on mass timber. We ask that producers fire treat the mass timber making it safer from fire loss and better for our planet by defending the carbon storage from fire, which also support building tall mass timber that become carbon storage banks. The tariff on imported steel creates a major opportunity for mass timber high rise growth, while adding fire protection would make this movement even greater. In 2018, we have had over 20 arson attacks on high density wood framed buildings. We cannot afford to have an arson attack a mass timber building when it only raw Class B at best it could set this movement back decades and we need it now to off set our need for imported carbon producing steel. We are convinced the first builder that reaches out to M Fire to add our fire protection to there mass timber building will get a significant risk premium reduction and a special discount from us to help promote the first mass timber Defended Carbon Bank in the USA. When evaluating building materials for fire safety, many factors including ignition temperature, smoke toxicity and flame-spread are considered. Flame-spread, used to describe the surface burning characteristics of building materials, is one of the most tested fire performance properties of a material. The best known test for developing this rating is the American Society for Testing and Materials (ASTM) Test Method E-84, commonly known as the tunnel test. The tunnel test measures how far and how fast flames spread across the surface of the test sample. In this test, a sample of the material 20 inches wide and 25 feet long, is installed as a ceiling of a test chamber, and exposed to a gas flame at one end. The resulting flame spread rating (FSR) is expressed as a number on a continuous scale where inorganic reinforced cement board is 0 and red oak is 100. The scale is divided into three classes. 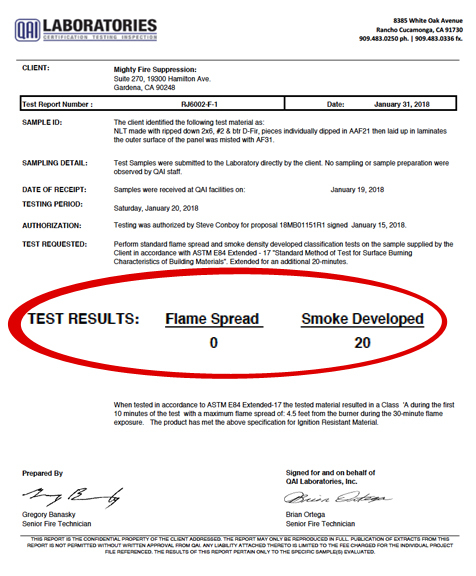 The most commonly used flame-spread classifications are: Class I or A, with a 0-25 FSR; Class II or B with a 26-75 FSR; and Class III or C with a 76-200 FSR. Class A - Flame-spread 0-25, smoke developed 0-450. Class B - Flame-spread 26-75, smoke developed 0-450. Class C - Flame-spread 76-200, smoke developed 0-450. 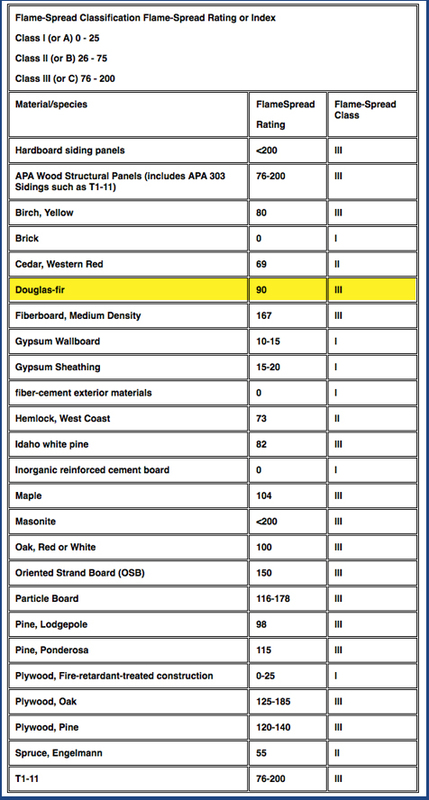 NFPA 101 primarily applies this classification to interior wall and ceiling finish materials. Roof coverings must meet a different set of criteria.